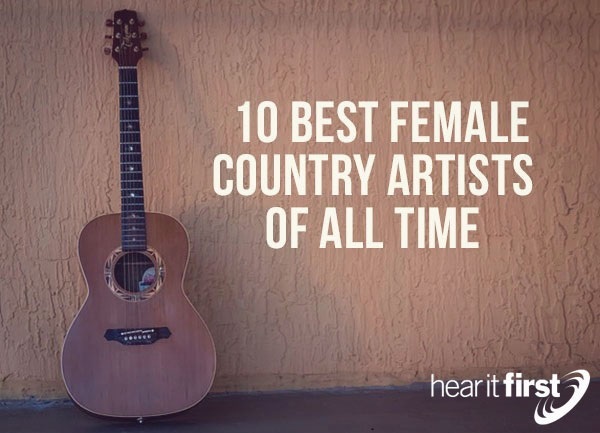 Here is a list of what most consider the ten best female country artists of all time. Has any female country artist made a greater impact than Dolly Parton? I don’t think so, and she’s still making waves today with her Dollywood amusement park and her songs, which so many are still being played on the radio that it’s impossible to mention them all. She is the “first lady” of country music. Dolly Parton is not only a great singer but she’s one of the best songwriters of all time, having written many of her own songs and sang by dozens. Not only is this classy lady a highly gifted American singer-songwriter, she’s an accomplished actress, author, businesswoman, and humanitarian, so Dolly Parton is much more than just a country music singer and it’s no wonder that she’s a “first ballot” country music hall of famer. Dolly Parton is also the most honored female country performer of all time and she ranks number one among all female country artists. Patsy Cline (1932-1963) was Loretta Lynn’s idol when she was growing up, but she also was for millions of other country music fans. Patsy Cline’s vocal range is close to incomparable and for much of the earliest period of country music, she was country music’s first of the first ladies. Her voice held such compassion. Maybe that’s because she knew how hard life can be. Her father died at an early age so she dropped out of school to be a “soda jerk” and waitress to help support her family. She ended up dropping out of high school, and even though she couldn’t even read music she was taught herself. It didn’t really matter because she had perfect pitch, made even better when singing such classics (in perfect pitch!) as “Walkin’ after Midnight,” “I Fall to Pieces,” and perhaps her greatest, “Crazy.” This is why this Country Music Hall of Fame singer is near the very top of the ten best female country music singers of all time. It’s commonly accepted that Oklahoma-born Carrie Underwood has moved into the top ten list of female country artists, but not just today’s top ten, but among the all-time top ten female country music singers. Brad Paisley said that Carrie is the greatest female voice in country music today, both men and women, and similar comments were made by Randy Travis, Loretta Lynn, Dolly Parton, Vince Gill, and Tanya Tucker, a fine singer herself. That’s high praise, to be sure coming from all this stars, but it’s not unmerited. Carrie’s range can be heard (or should I say “experienced”) when she sings “How Great Thou Art” during her live performance with Vince Gill. Millions have heard her sing “Church Bells,” “Jesus Take the Wheel,” and “Before he Cheats.” And people say that she’s one of the nicest, most humble people you’ll ever meet. Apparently, success has not gone to this Christian woman’s head. She gives God the glory for what she’s been able to do. And that is what people like about her, besides her vibrant voice that is as good as you’ll hear today in any genre of music. Faith Hill is considered to be in the top seven of the best female country artists of all time. That’s been agreed upon by most of the country music experts. Faith Hill is an American country pop singer that sings more down to earth songs with “homey feelings” and things we can all associate with. Maybe this is why Faith Hill’s music has crossed over into the pop genre. Her songs are so moving and deep, that you can’t help but be drawn to them. That’s the reason this lady has sold over 40 million records (and counting) around the world, and is still considered the best contemporary country music female singer. Others would add, she is one of pop music’s greatest as well. Her style and voice allow her to cross over into genre’s that don’t typically don’t mix, but this lady can do it all, and make it look easy. She’s demonstrated that with songs like “Breathe,” “The Kiss,” and “Like We Never Loved at All.” That’s why she’s a definitely in the top ten of the best female country artists of all time. Reba McEntire is not only an American country music singer, she’s also a gifted songwriter, record producer, actress, and even a television producer. Some of her comedy work is among the best of the sitcoms. She’s had such an impact that she seamlessly moved into acting and later, directing, however I believe her greatest strength (or gift) is her voice. She sings with a voice that has crystal clarity and in a powerful, yet delicate way. Reba McEntire is poised enough to do just about anything in front of a camera or behind one. Her list of hits include “I’d Rather Ride Around With You,” “That’s What He said, “Fancy,” “Because of You” (with Kelly Clarkson), and “The Greatest Man I Never Knew.” This hall of fame country music singer deserves to be among the ten best female country music singers of all time. Shania Twain certainly deserves her place among the top ten best female country artists of all time. Her songs, “Come on Over, Up!,” “The Woman in Me,” and “From This Moment On” with Brian White, which is considered her best, have carved her niche into country music history. Her collaboration with Brian White on “From This Moment On” made this an extraordinarily successful song, but other top ten songs by Shania Twain were “Whose Bed Have Your Boots Been Under,” “You’re Still the One,” and “Any Man of Mine.” Pick any of those songs, and you’ve got the very best of Shaina Twain, who is among the very best of the best of the all-time female country music singers. Martina McBride is an American country music singer, songwriter, and record producer who fit perfectly among the 10 best female country music singers of all time. She sings songs that make us weep and move within us because we can relate. Songs like “When Love is Gone,” “Wild Angels,” and the powerfully patriotic, “Independence Day,” which has left its mark on our nation, are infectious to the ear and “Independence Day” is still considered one of the most patriotic songs ever written (or sang!). The songs she writes seem to connect her audience to her own life…in very deep ways. Is it because her listeners have shared some of the same things that Martina has? You can hear that in the song, “A Broken Wing,” and “Concrete Angel.” This lady deserves to be among the top ten best female country music singers of all time. When I was young, I used to listen to Tammy Wynette, but so did millions of others. She had dozens of number one songs and clearly deserves to be among the top ten, all-time, of female country music singers. It seemed you couldn’t go a day without hearing her voice in the 1960’s and into the 70’s. Everyone knew her voice it seemed, even those who didn’t like country music. By far, her greatest hit was “Stand By Your Man,” but the most painful (and moving) song she sang was “D-I-V-O-R-C-E,” which was a touching story (in song) about a couple who were divorcing and they were trying to shield the children from it. Many of us can identify with that! Other songs that are now all classics, include “I Don’t Wanna Play House,” “Bedtime Story,” and “Kid’s Say the Darndest Things.” With so many number one hits over so many years, this American country music legend who is both a singer and songwriter, deserves to be in a class among the best as she’s is near the top of country music's best-known singers and biggest-selling female singers of all time. Since Brandy Clark is so young, we don’t yet know how much of a full impact this dynamic country music singer and songwriter will have. Based upon potential, we believe she may end up her. She’s not just been hot on the charts recently; she’s been white hot, with songs like “Stripes.” This American country music singer-songwriter was nominated for Best New Artist in the 2015 at the Grammy Awards. Her entourage includes “Crazy Woman,” “The Day She Got Divorced,” and “Pray to Jesus.” Expect to see a lot more of Brandy Clark because this young women’s potential seems limitless. There are so many more I could have included in this list. It was difficult to leave out such hall of fame singers like Barbara Mandrell, Emmy Lou Harris, Miranda Lambert, Trisha Yearwood, LeAnn Rimes, Le Ann Womack, Wynonna Judd, Kitty Wells, and Tanya Tucker. Who would you have included or excluded? Did we miss one (or more)? Let us know.